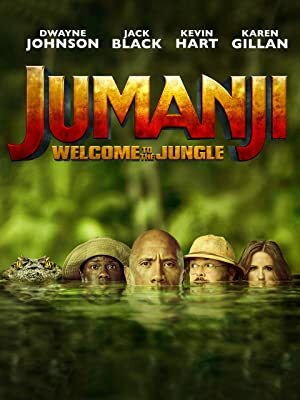 Alright, so I know this isn’t *technically* YA, but there are two very good reasons I have for reviewing this: 1) the story of Jumanji is actually based on a children’s book from the 80s and 2) it’s about teenagers of different social groups forced to work together, like you see in a lot of YA. So I thought it appropriate. Oh, and also #90sNostalgia. I grew up watching the original movie and while I absolutely love Robin Williams, it gave me the heebie-jeebies. When four high schoolers of different social groups are sent to detention, they soon find something to keep their interest: an old gaming console with some weird game called Jumanji. But as they begin playing, they literally get sucked into the games as their avatars. And it quickly becomes clear that they aren’t just playing a game–they’re playing for their lives. To beat the game and return home, they’ll have to work together, discover what Alan Parrish left 20 years before, and learn a little about themselves. Oh my gosh, this was hysterical. The story starts off a lot like The Breakfast Club with four very different students stuck together in detention. There’s Spencer the nerd, Fridge the jock, Bethany the Instagram-obsessed preppy girl, and Martha the argumentative nonconformist. This part was pretty angsty, but also had funny moments. But the real fun begins once they get stuck in Jumanji. Let’s keep in mind that of the four teenagers, two are boys and two are girls. In the game, one of the girls has a male avatar. I don’t want to ruin it by saying more, but that was by far the funniest thing of the entire movie. I was rolling. The acting on the parts of our four leads (Black, Hart, Johnson, and Gillan) was really great because really, they’re playing teenagers stuck in different bodies. And it was really funny while still feeling like lost teenagers. Each and every one of them had moments to shine and it was fantastic. There’s even a surprise actor in the movie and I’m certainly not spoiling that. Suffice it to say I may have squealed a bit when I saw who it was. The plot of the game is pretty typical of a 90s video game. Pass the levels, beat the game. That sometimes seemed cheesy. But factor it in with the character development and what these teenagers were going through and it was pretty good. The simplicity of the game, while often cliche, allowed the characters to shine because we didn’t have to think too hard about what they were being asked to do. We could focus on their arguments with each other or the way they seemed to be growing as people. I really appreciated that. I also appreciated the structure of pairing the teens with the avatars that were least like themselves to give them something to struggle with. I will say for those who are hoping it’s similar to the original Jumanji, it’s not. Not really. Sure, they get sucked into the game and have to fight to survive, but this doesn’t have anywhere near the same danger level as the previous movie. This is a hilarious (and sometimes a little raunchy) comedy movie about teens getting sucked into a game. It is nothing like the suspense and terror I felt as a kid watching a town get overrun by exotic animals, a mad hunter willing to kill people, a floor turning into quicksand, or a boy turned into a monkey. This movie isn’t really scary at all. But I enjoyed the heck out of this movie. I love laugh-after-laugh comedies and that’s what this was. I enjoy witty banter between characters and seeing character development. I got all of that. Sure, it’s not the same as the 90s version, but did I expect it to be? No. Nothing’s going to match Robin Williams, and I’m glad they didn’t really try. This is how Jumanji evolved for our lives. It didn’t just become a video game; it became a comedy too. Great review -I haven’t read or seen the original Jumanji story but really enjoyed the new movie!